Italy’s Fabio Buzzi—powerboat designer, engineer, builder, racer—added another endurance record to his lengthy life-list of offshore events. In late September of last year, Buzzi and a crew of four—in a 39.9′/12.2m stepped, composite monohull produced by FB Design, Buzzi’s yard in the Lake Como region—broke the Bermuda Challenge record by 4.5 hours. Powered by twin Fiat diesels, FBD’s craft covered the 780-statute-mile course between New York Harbor and St. George, Bermuda, in 17 hours 6 minutes. On September 28, 2012, Fabio Buzzi, founder and chief executive of FB Design (Annone Brianza, Italy), added yet another offshore record to an extraordinary lifetime list of ocean race wins and endurance marks. His latest was a run he’d never tried before: from New York Harbor to St. George, Bermuda, achieved in 17 hours 6 minutes with a 39.9′ (12.2m), 9-ton, cabin-model production craft designed and built by FBD for the Italian Army’s special forces. Average speed in the stepped monohull was 40 knots. Buzzi and a crew of four broke the previous record by more than four hours, set the month before in a 37′ (11.3m) Statement Marine center-console fitted with twin Cummins/MerCruiser TDI diesels. Called the Bermuda Challenge and created in 1994 by Boating magazine, the powerboat-only race rules specify a length limit of 40′. Previously, just four contenders have successfully completed the 780-statute-mile open-ocean transit over the years. 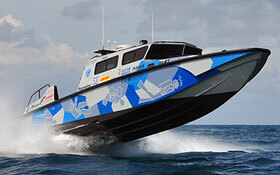 The baseline record was established in 1996 in a 26′ (7.9m) Glacier Bay cat powered by twin 90-hp Honda outboards—the largest motor in the product line at the time—in 37 hours. The boat company and the engine manufacturer were sufficiently pleased with that result to use it in their respective marketing programs. Here’s a closer look at the record-breaking boat. Power—A pair of 650-hp (485-kW) production diesels from FPT (Fiat Powertrain Technologies). They’re common rail, weigh 2,072 lbs (940 kg) each, with a fuel consumption of 61 gal/hr (231 l/hr) for both. Top speed of this boat is 58 knots in lightship condition; 47 knots with a 5-ton payload. Transmission—A special version of the ZF 312 two-speed gearbox, in G-drive configuration. Meaning, the surface drive is coupled directly to the gearbox, to reduce weight, space, and noise. Drive—A ZF Trimax 2500 fixed surface-drive. Props—Five-blade, bronze-cast, and completely machined, by Eliche Radice (Milan, Italy). Rudders—FBD patented “Safety Rudders,” featuring a sacrificial pin in case of impact with floating objects. Tabs—FBD’s patented, electronically controlled Tri-tab system, to get on plane quickly, even with a payload in excess of 5 tons. Tankage—This boat was specially prepared with four separate stainless steel fuel tanks: two of 185 gal (700 l) each beneath the cockpit, and an extra two in the cockpit of 265 gal (1,000 l) each. A fifth 132-gal (500-l) tank, of rubber, was installed toward the bow. Two electrical pumps transfer fuel as needed, and to maintain trim. Seating—Six G12 seats, so called because they can accommodate a 12-g load. Designed by FBD and made by Tecno. A/C—A lightweight 33,000-Btu Condair air-conditioner, with power supplied by one of the gearboxes. Designed and patented by FBD. Navigation—Three GPS units by Raymarine, all with Navionics maps. And, a special night-vision “light amplifier,” made in Italy. There are a few more notes worth mentioning. First, in the PBB articles on Buzzi and FBD cited earlier, you’ll find detailed descriptions and illustrations of almost every item on the boat list above. Second, a pertinent postscript to this Bermuda story and to those PBB articles: the 48′ (14.6m) FBD-designed and -built raceboat called KeraKoll (a sponsor name) that was in the process of being refurbished and prepped for its new owner at the time of our site visit to FBD, did in fact break the Venice–Monte Carlo record, an endurance record previously held by Buzzi himself. KeraKoll accomplished that with small fuel-efficient FPT diesels co-developed by FB Design. Finally, keep in mind the reported sea conditions during Buzzi’s Bermuda Challenge run as you read about wave impacts and vertical accelerations elsewhere in this issue. FB Design, Provinciale 73, 23841 Annone Brianza (Lc), Italy, tel. +39 0341 260105, fax +39 0341 260108, website www.fbdesign.it. Because of their positive locking mechanism and strength, Tenax fasteners are a durable alternative to the more common canvas snaps. 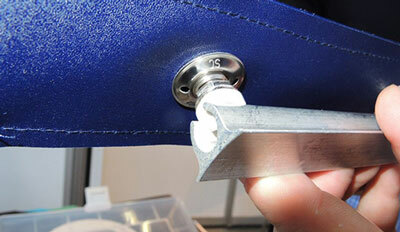 To release the fastener, one raises the button on the female section with thumb and forefinger. What boat owner hasn’t cursed the familiar canvas snap? It gets jammed and refuses to release when you want it to, which, as the user’s frustration level rises, often leads to torn canvas and a broken snap. Or it refuses to stay connected to the base, resulting in flapping canvas, damaged gelcoat or paint, and more frustration. Along with canvas pros, many boat owners who rely on these snaps have come up with clever ways of making sure they remain operational, including greasing, waxing, and even oiling the spring ring in the female section. As I walked the 2012 Marine Equipment Trade Show (METS) in Amsterdam last November, I found a booth exhibiting the self-locking Tenax fastener. The secret of this design is in its positive locking mechanism; it won’t release unless the button on the female section is raised with the thumb and forefinger. The connection is so secure that it’s employed by, among others, the U.S. military for securing bomb-resistant clothing, and by guitar manufacturers, under the name LOXX, for attaching shoulder straps to the instruments. It’s capable of supporting tensile forces of up to 1,000 newtons (224 lbs). Designs include knurled and bail-equipped lifting buttons; and male fasteners can be equipped with tapping or machine screws. Surface finishes are what you’d expect for a product suitable for marine applications: chrome, black chrome, gold, stainless steel, and nickel. The fastener has been used for decades on German and British automobiles, as mentioned above, as well as for luggage and camping gear. In 2008 Schaeffer was sold and renamed Schaeffertec. The largest distributor in the U.S. is Eagleday. The unit is pricey at about $8 per male/female set, but, hey, this is fine German engineering. If you want the ultimate in canvas security and for a variety of other uses, try it. Schaeffertec GmbH, Kleinbeckstr 7, D-45549 Sprockhövel, Germany, tel +49 2324 9049–0, website www.schaeffertec.de/en/tenax.html. Eagle Day Inc., 304 Indian Trace, #168, Fort Lauderdale, FL 33326 USA, tel. 954–349–3037, fax 954–495–8470, website www.eagleday.com. Dometic’s in-duct air purifier installs in air-conditioner ductwork to remove offensive odors including tobacco smoke, mildew, and toilet vapors. Because boats must keep out water from sea and sky, they tend to keep odors in…odors generated from fuel, food, people, and living organisms we cannot even see—dying plankton in the toilet bowl, for instance—as well as molds and mildew. A funky-smelling cabin is unpleasant. Solutions include opening hatches and portlights, running ozone generators when the boat is unoccupied, dehumidifying with electric units or static bowls of salts, and operating fans to evaporate moisture and circulate air. But in hot, humid climates, where one is loath to open hatches and is dependent on air-conditioning systems to remain comfortable, most of the above are impractical. 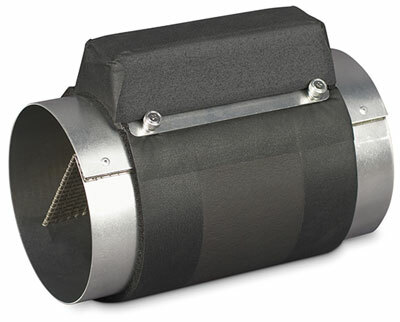 Dometic developed its Breathe Easy In-Duct Air Purifier to help eliminate onboard odors. Said to install easily into an air-conditioner’s ductwork, it employs “ultraviolet light and photocatalytic nano-mesh technology to remove up to 99.9% of the biological and chemical contaminants—including the odors of tobacco smoke, mildew, mustiness, chemical vapors, and toilets.” That’s according to tests performed by the Environmental Diagnostics Laboratory (Clearwater, Florida). Winner of an Innovation Award at the 2010 IBEX, the Breathe Easy is available in various sizes, to fit ducts ranging from 4″ to 8″ (10cm to 20cm). Length is either 10½″ or 13½″ (27cm or 34cm). 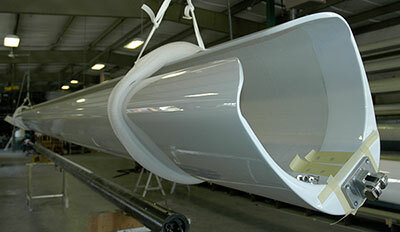 A number of boatbuilders, including Formula and Trinity Yachts, install the Breathe Easy for customers. Dometic Marine Division, 2000 N. Andrews Ave., Pompano Beach, FL 33069 USA, tel. 954–973–2477, fax 954–979–4414, website www.Dometic.com/Marine. 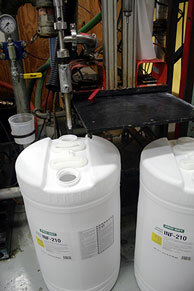 PRO-SET epoxies, manufactured by Gougeon Brothers in Bay City, Michigan, have been reformulated and updated to form a more “cohesive and logical” product line for all customers. Establishment of four distinct product categories: Laminating (LAM), Infusion (INF), Tooling (TLG), and Adhesives (ADV). 3:1 mix ratio for all laminating and infusion epoxies. Ability to choose resins by viscosity, and hardeners by speed. Hardeners priced the same within each category, regardless of cure speed. 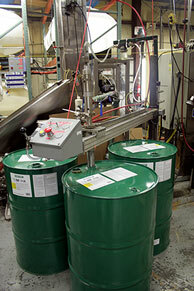 The new formulations went into effect January 1, 2013. For builders who might have some old PRO-SET stock lurking in the shop, it’s important to note that old and new resins and hardeners should not be mixed together. However, the new formulation can be applied to make repairs to existing laminates built with the original PRO-SET chemistry. For more information, contact Joe Parker at parker@nullprosetepoxy.com. PRO-SET, P.O. Box 656, Bay City, MI 48707 USA, tel. 888–377–6738, website www.prosetepoxy.com. Unlike some push-button furling systems, GMT PowerFurl booms allow the mainsail to be raised and lowered on any point of sail. 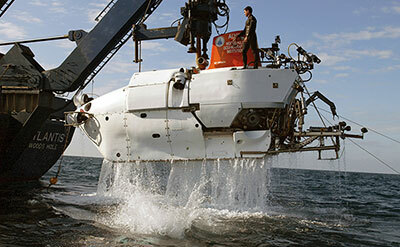 GMT Composites was commissioned by Wood’s Hole Oceanographic Institution to build ballast tanks for the deep-water research submersible Alvin. 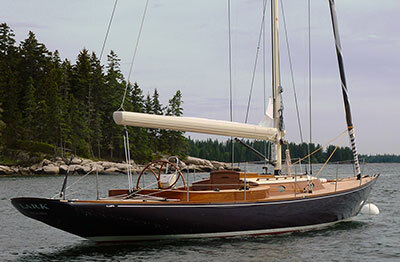 Lark, a 47′ (14.3m) daysailer built by Brooklin Boat Yard, was among the several Maine-built boats to receive a carbon fiber rig from GMT Composites last year. While some boatbuilders are successful by sticking with their core business, i.e., building boats, over the years others have found it necessary to diversify into the nonmarine industrial world. TPI Composites was a good example, making all sorts of products from composite telephone poles to wind turbine blades to people movers to small exercise swim pools. Another company from the State of Rhode Island is GMT Composites, founded in 1984 by builder Eric Goetz to make high-tech parts for other builders as well as for his own yard (which has been in and out of business over the past decade). GMT has found demand for its precision carbon work in the medical scanning field, robotics, and architectural sculptures. Here is a brief look at three recent marine-related projects. First was a commission from the Wood’s Hole Oceanographic Institution, in Massachusetts, to make the three main ballast tanks for its submersible vessel, named Alvin—familiar to millions around the world for scanning the wreck of the Titanic. A major refit is taking place to increase its maximum depth rating from 4,500m to 6,500m (2.8 miles to 4 miles), which will enable it to explore all but the very deepest ocean trenches. From GMT’s press release: “Pressures at these depths exceed 5 tons per square inch, and any air pockets in a laminate would get crushed. No paint will be used on the ballast tanks so they can easily be visually inspected for any void content or damage. Alvin’s passengers will be housed in a new titanium sphere, which was forged from two solid pieces of titanium ingots weighing 17,000 lbs [7,701 kg] each.” Alvin is certified by the Naval Sea Systems Command (NAVSEA). In 2008 GMT began building, to its own design, furling booms for sailboats, a logical extension of its carbon fiber spar business. The PowerFurl boom houses a motor-driven mandrel inside the boom, which the company says has several advantages: the mandrel doesn’t have to go through the mast, which allows the sail to be raised and lowered on any point of sail, and a lower-profile sail track is possible. The original design was for yachts between 45′ and 120′ (13.7m and 36.6m). Recently completed was a 35′ (10.6m) carbon fiber PowerFurl boom for a custom 70′ (21.3m) catamaran under construction in Brazil. The part was resin-infused with a foam core and as many as 29 layers of carbon fiber in load sections. Despite their higher cost over aluminum, all-carbon rigs have become popular in recent years because they offer significant weight reductions aloft that improve stability. The third project is actually a group of carbon fiber spars for custom builds in Maine, taking place at Brooklin Boat Yard, French & Webb (Belfast), and Artisan Boatworks (Rockport). The latter yard specified GMT’s Faux Bois finish for the Buzzards Bay 18 (5.5m) it was building last summer. Said to look very close to real spruce, the Faux Bois finish is a hand-painted coating system offered in addition to basic colors. If one wants the spars to look completely, authentically traditional, custom tooling can be made to replicate the tapers and shapes of masts, booms, and spreaders of yesteryear. GMT Composites, 48 Ballou Blvd., Bristol, RI 02809 USA, tel. 401–253–8802, fax 401–253–9395, website www.gmtcomposites.com. The Kavalk 25 (7.6m) SportRunner is the latest runabout from Kazulin Boats in Ontario, Canada; where past models had wood decks, the SportRunner is all fiberglass. Kazulin boats have been compared favorably with Rivas, another high-end brand favored as tenders by the owners of superyachts. 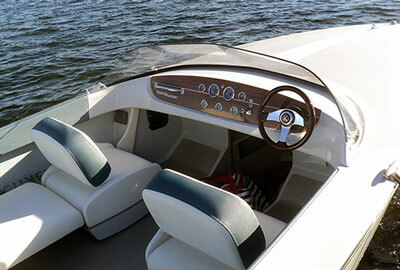 Kazulin Boats recently introduced its first all-fiberglass runabout since the 1980s; models produced between then and now had wood decks with teak or mahogany overlays. President Tony Kazulin says they’ve found a new nonskid material available in various colors and textures that they like well enough to make the change. Of more-than-passing interest is the long history of the Kazulin family—Tony Kazulin is the seventh generation to build boats. The family originated in Croatia, building commercial wood vessels on the Adriatic Coast. In the early 20th century, Tony’s grandfather, Simon Kazulin, designed and built commercial motor-driven wood fishing boats at Skansie Shipyard in Gig Harbor, Washington. No two were the same; each was for a specific purpose and client. He had two sons, both builders: Mike, who during the 1960s built wood boats in Tacoma; and Velko, who had stayed in Croatia and built boats there. It is notable that Velko switched from wood to fiberglass in 1959, introducing in 1965 what is said to be the first series-produced fiberglass boat in Eastern Europe, a 17′ (5.2m) utility boat named the Barka that eventually numbered in the thousands. Tony Kazulin says it’s still in production. When Communist rule of the country became too oppressive, Velko and his family obtained visas from the Canadian embassy to visit Vancouver, and never returned. Velko taught his son Tony the builder’s trade, which under his care has evolved from simple wood utility boats to high-end custom runabouts. Kazulin Boats, tel. 613–363–7288, website www.kazulinboats.com. Cold Jet employs dry ice—solid CO2—as a blast medium in its spray equipment for applications that include cleaning of parts and weld seams, paint removal, and mold remediation. 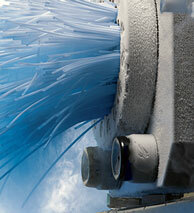 Dry ice is safe for water-sensitive areas such as enginerooms. As old as paint, as old as rust, as old as grime is the problem of how to remove them from the surface upon which they’re affixed, without damaging that surface. Hand sanding and cleaning is often impractical, ineffective, and inefficient on many coatings, especially when the surface area is large, such as a hull bottom. Spraying an abrasive media under high pressure works like a charm, but sand, while appropriate for some jobs, can easily damage composite materials. Baking soda was introduced as a safer alternative, but in the hands of an inexperienced operator, it too can be harmful. A third option is dry ice, which has been around for 25 years, according to Cold Jet, a Loveland, Ohio, company that makes the media and associated spray equipment for numerous applications: cleaning parts, mold remediation, weld cleaning, food service cleaning, and dozens more. Recently, one of its dealers in Louisiana was commissioned to clean the engineroom of a freighter, because spraying with other media was considered too risky for the engines and electrical equipment. Dry ice is nothing more than solid CO2, the same CO2 that occurs in nature as a by-product of respiration. It is made by dramatically lowering its temperature. At –108°F (–78°C) and at atmospheric pressure, solid CO2 sublimates directly to vapor without a liquid phase. According to Cold Jet, “This unique property means that the dry-ice blast medium simply disappears, leaving only the original contaminant to be disposed of. In addition, cleaning in water-sensitive areas (e.g., in the vicinity of electrical cabinets) is now practical.” It is nonpoisonous, nonconductive, and nonflammable. In production, it can be extruded and stored in various forms—pellets, nuggets, slabs, slices, snow, and blocks. 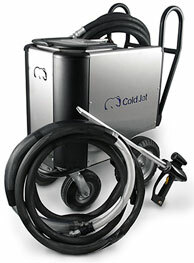 For heavy users, Cold Jet sells the machines that make dry ice, as well as the machines to dispense (spray) it as a blast media. It also sells and ships its proprietary dry ice. Back to the case history: The ship in question is a 258′ (79m), 2,100-ton research and fishing vessel built by the Japanese government in 1971, and recently bought by an American who is having it converted to a yacht. The restoration includes overhauling equipment and systems in the engineroom, which according to Dustin Thompson of Louisiana CryoJet, a Cold Jet dealer, appears never to have been cleaned. Sandblasting was ruled out, as was baking soda for fear its caustic nature would damage hydraulic and electrical systems. So was removing equipment, as too expensive and too time-consuming. Louisiana CryoJet was given just 30 days to remove 40 years of paint and crud. Thompson’s team completed the job in the time required, using 25,000 lbs (11,325 kg, 50 totes) of dry ice. Because the pellets disappear on impact, no containment measures were necessary. Cold Jet, 455 Wards Corner Rd., Loveland, OH 45140 USA, tel. 800–337–9423, fax 513–831–3211, website www.dryiceproduction.com. Widely regarded as one of the brightest minds in yacht design, Britton Chance Jr. died last October in Branford, Connecticut, from complications caused by a stroke. As with many successful yacht designers, Chance never earned a college degree, though he studied mathematics at Columbia University and physics at the University of Rochester. His intellect was sufficiently keen that he was hired to teach naval architecture and engineering at Yale University. Chance grew up on Barnegat Bay, the son of a scientist and Olympic yachtsman, and left school to work for the designer C. Raymond Hunt, and later for sailmaker, designer, boatbuilder, and yachtsman Ted Hood. He opened his own design office, Chance & Company, in 1962. Among his many accomplishments: lead designer for the 1987 and ’89 Stars & Stripes America’s Cup campaigns, the latter the 60′ (18m) catamaran on which Dennis Conner defeated the 90′ (27m) New Zealand challenger; Olympic and World Championship racing shells (rowing was a favorite pastime); and numerous ocean racers that performed successfully in such events as the Southern Ocean Racing Circuit, Transpac, Admiral’s Cup, and many others. The Qwik-Lok plumbing system secures poly­propylene fittings to standard flexible hose by means of an Oetiker metal clamp, and to other accessory fittings via a positive locking mechanism. The past few decades have seen a trend away from plumbing boats with flexible vinyl hose, and replacing it, where appropriate, with rigid plastic piping and quick-connect fittings. Several companies make such systems, citing advantages for the installer and boat owner. 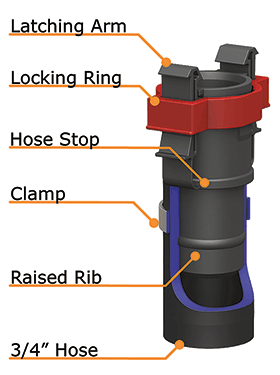 A major advantage is a superior seal at fittings, where a precision-molded part with O-ring seal is much less likely to leak than the vinyl hose squeezed onto a barb and secured with a perforated hose clamp; the likelihood of the latter to leak is why conscientious installers use two clamps on every fitting. One of these manufacturers is Flow-Rite, whose system is called Qwik-Lok, but it has taken a different approach. Rather than employ rigid plastic pipe, Qwik-Lok polypropylene fittings install on standard ¾″ (19mm) and 1-1/8″ (29mm) flexible hose, so that not all turns have to be fixed angles. The polypropylene parts consist of male and female fittings; sockets are secured to hose with an Oetiker metal crimp clamp. For 1-1/8″ hose, these parts cost $1.71, $1.93, and $0.71, respectively. Other parts include a 12″ (305mm) threaded standpipe ($10.95), a ½″ (13mm) NPT × 1-1/8″ QL male fitting ($3.15), a 1-1/8″ two-part through-bulkhead fitting ($7.88), and a 1-1/8″ through-hull fitting ($4.24). 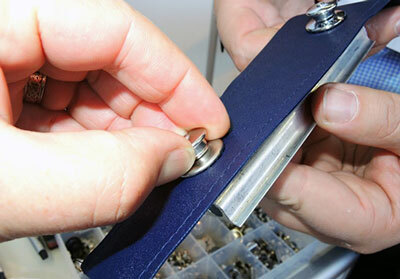 These and more accessory fittings are available in the ¾″ size, as well as valves and pumps. To assemble, slip the crimp clamp onto the hose, insert the Qwik-Lok fitting and twist into full depth, slide the clamp over the fitting body inside the hose, and crimp with the crimping tool ($29.95); a tile cutter would probably do the job as well. The socket fitting then receives the male fitting, such as a through-hull, connector, or adapter, which snaps into place and locks with a sliding ring. Flow-Rite offers plumbing kits for OEMs. Six years ago, Legend Boats, which builds bass boats in Midway, Arkansas, found it was spending too much time installing plumbing, in part because of accessibility issues in cramped, dark spaces. Once each hose length was measured, Flow-Rite could cut and preassemble all sections and provide Legend with a complete plumbing kit; connections can be made with one hand. Each kit is shipped complete, with a single part number to save clerical time. Flow-Rite Controls, 960 74th St. S.W., Byron Center, MI 49315 USA, tel. 615–443–0264, website www.flow-rite.com.